Handling corrosive substances can be very dangerous if proper safety precautions are not met. Before handling or storing corrosive materials, obtain and read through material safety data sheets (MSDS) for each chemical that is being stored. Understand hazards and risks that are associated with the materials, including chemical reactivity, fire and health. 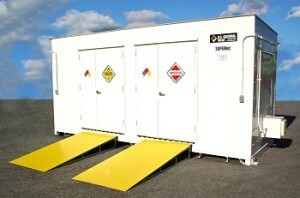 Get protected with a corrosive storage building by US Chemical Storage. Mechanical ventilation systems and exhaust fans are designed to remove vapors, fumes and dusts that corrosive materials give off. The amount of ventilation that is necessary depends on the quantity of corrosive materials being stored, the size of the corrosive storage building, where the building is placed and the processes in which it is being used. Be sure to inspect all containers that are being used to store corrosive materials. Damaged and improperly labeled corrosive storage containers can result in life-threatening incidents. Some corrosive materials are incompatible with each other, therefore solid partition walls or separate corrosive storage buildings must be used. Acids and bases react and must be segregated. Store corrosive containers at or below eye level. Corrosive storage buildings must be properly ventilated, with properly labeled containers inside the building and warning signs external to the building. Corrosive storage containers should be inspected regularly for any corrosive damage and/or leaking substances. Materials being stored should be properly labeled and organized to avoid any confusion when loading or unloading inventory. Corrosive storage buildings can be designed with corrosive storage paint, for increased protection, depending on storage requirements and location. Meets EPA, OSHA, NFPA, IFC, IBC regulations and FM approvals or Warnock Hersey standards. Corrosive storage should be kept in a cool, dry atmosphere and away from direct sunlight or any heat sources to avoid chemical reactivity. If chemical storage containers are subject to direct sunlight or heat, vapors can build up causing the container to explode or catch fire. Avoid any temperature changes with climate controlled storage buildings. To learn more about our corrosive storage buildings by US Chemical Storage call 888-294-2729 or visit us online.